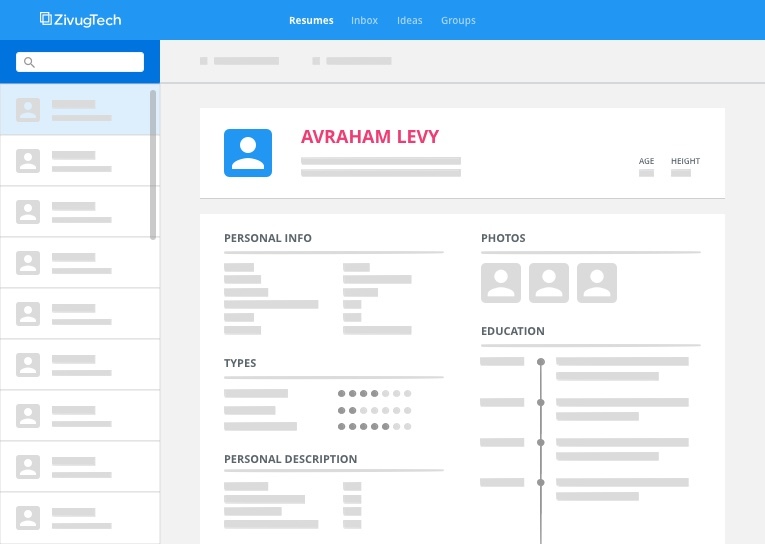 Create, share, and view shidduch resumes. Meet the new tool for creating digital shidduch resumes and easy suggestions. We’re bringing resumes into the 21st century. Create a resume once, share it from anywhere. The resumes section organizes shared and suggested resumes. So you can easily review resumes and suggested ideas. Updated resumes are the genius of ZivugTech. One update, and your digital shidduch resume is updated across the system. Search for or request a resume, then send it off. Your dedicated “shidduch inbox” becomes your messaging tool for resumes and exchanging information. Your resume is private until you share it or add it into a group. Then it becomes public so others can share it and suggest ideas. Tracking ideas is one of the best kept secrets of ZivugTech. Just keep moving a suggested pair through the “Ideas” boards - so everyone’s on the same page. easy sharing and efficient progress tracking. Make a school, neighborhood, or any other group you’d like. Then efficiently collect and search resumes. dedicated to helping singles find their bashert.